Back in 1971 the GT was a bike to be ridden every day, it combined sport bike and touring features in a balanced and beautiful Italian package. With a dual seat and single headlamp, it was an essential motorcycle, much like today’s “naked” or “traditional” motorcycles. It was a commonsense motorcycle, but its beauty was uncommon. The L-Twin engine was left fully exposed to flaunt its elegant features. 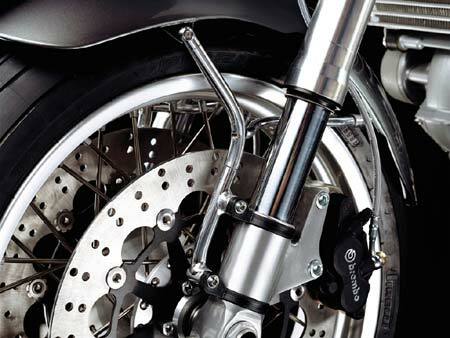 Dual chrome silencers swept rearward accenting the attractive lines of the bike. Everyday performance was never so well executed. Until now. 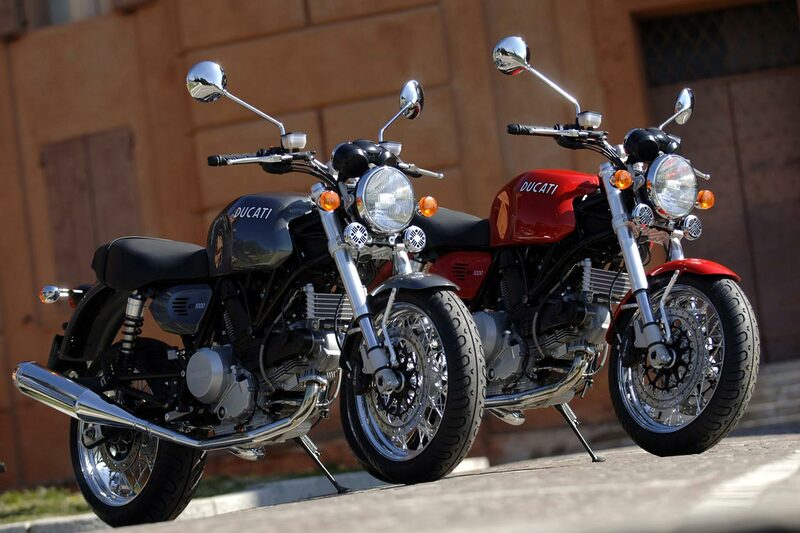 Although classically styled, the 2006 GT1000 is engineered to deliver modern Ducati road performance. With its comfortable two-up riding position and confident handling, it is perfect for the daily commute or a weekend trip to the mountains. 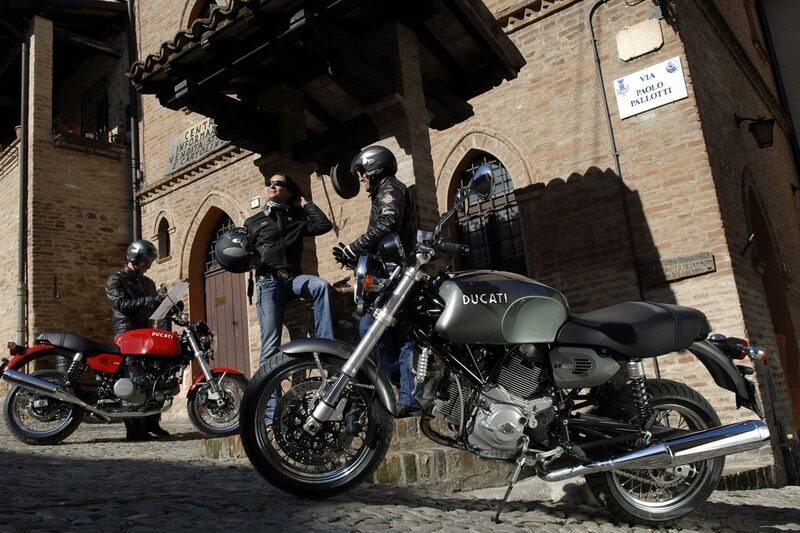 Powering the GT is the 1000 DS engine, the most advanced, most powerful Ducati air-cooled engine ever. The essential beauty and style of the Ducati GT models of the 1970s – a bike to be ridden every day with a balance of two-up comfort and Ducati Desmo power. The GT1000 introduces many new features that reflect fondly on the past, while being interpreted in a thoroughly modern way. The classic inspiration and performance of the Sport Classics doesn’t end with the motorcycles. The style that makes the bikes so appealing has been applied to an extensive range of accessories and apparel. The GT1000 will be available in the spring of 2006. 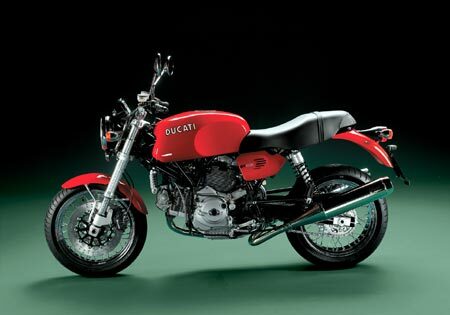 The Ducati SportClassic family, which includes the Paul Smart 1000 Limited Edition, the Sport 1000 and the GT 1000, reflects the styling of the motorcycles built in Ducati’s workshops in the 1970’s, characterised by a minimalist racing look, with exposed chassis and engines, complimented by bodywork with elegant rounded shapes. Even though they reflect the best of the past, they incorporate the latest Ducati technology and engineering, creating a thoroughly modern motorcycle that lives up to today’s standards of road-going performance. Engineer Taglioni’s first production machine to use the new 750 engine would be the GT 750 which was introduced onto the market in 1971. The bikes captured the bold 70’s styling with metal flake paint jobs of orange, blue and green reflecting off chrome Silentium mufflers and polished aluminium engine cases. The “round case” design bevel twin is still regarded as one of the most beautiful Ducati, for that matter, motorcycle engine of all time. The new GT set trends not only for style, but also for quality and performance. Its frame design was born of the Ducati 500GP, developed by acclaimed racing chassis designer Colin Seely. The frame used the stout twins engine cases as a “stressed member,” a practice so sound that even today Ducati Trellis frames continue the “stressed member” engineering solution. The GT also broke ground with suspension by fitting large 38mm diameter forks by Marzocchi, while it was typical for the day to fit 35mm or smaller forks. The new L-Twin engine and a fantastic chassis combined with alloy wheels by Borrani laced with straight-pull spokes, stainless steel mud guards, and a disc brake to set new standards for quality and performance. So impressive was the new Ducati, in October 1972 US motorcycle magazine ‘Cycle’ enthusiastically described the GT 750 by saying – “When the right-side footpeg nicks down in an 80 mph sweeper and the bike never bobbles…you know that a motorcyclist designed this machine, and he got it right.” Bravo Engineer Taglioni! The first Ducati GT 750 was produced from 1971 to 1974, and the engine size was increased in 1975 with the introduction of the GT 860. 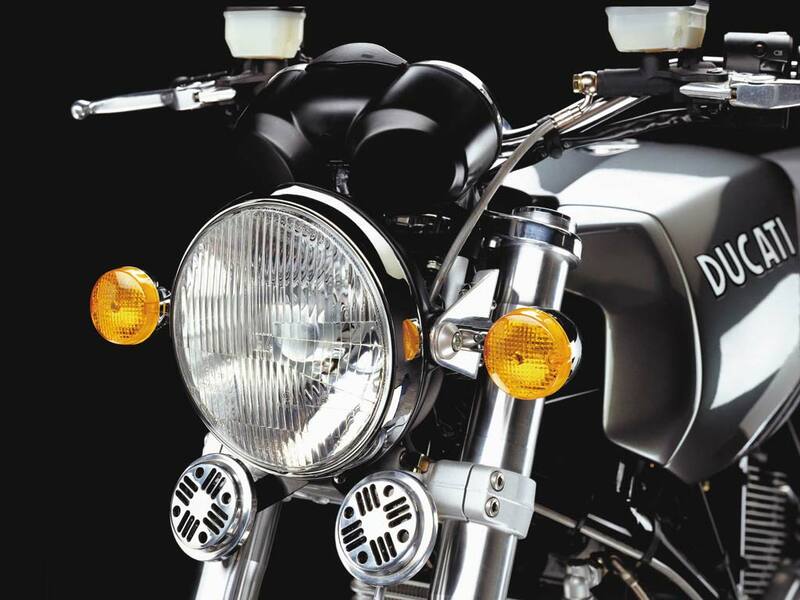 A series of technical and stylistic developments were made for the GTS 860 version, which was one of the key models on the international motorcycle scene from 1976 to 1980. 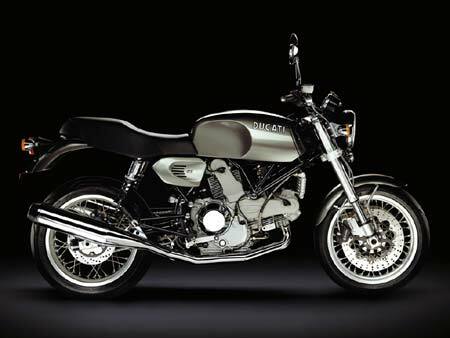 The essential beauty and timeless style of the Ducati GT models of the 1970’s now comes to life again with this bike. The new Ducati GT 1000 is a bike to be ridden everyday, with a balance of two-up comfort and Ducati Desmo Twin performance. 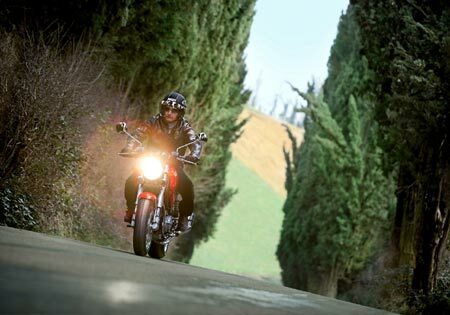 The classic tradition of Italian Grand Touring returns in a successful mix of style and performance. 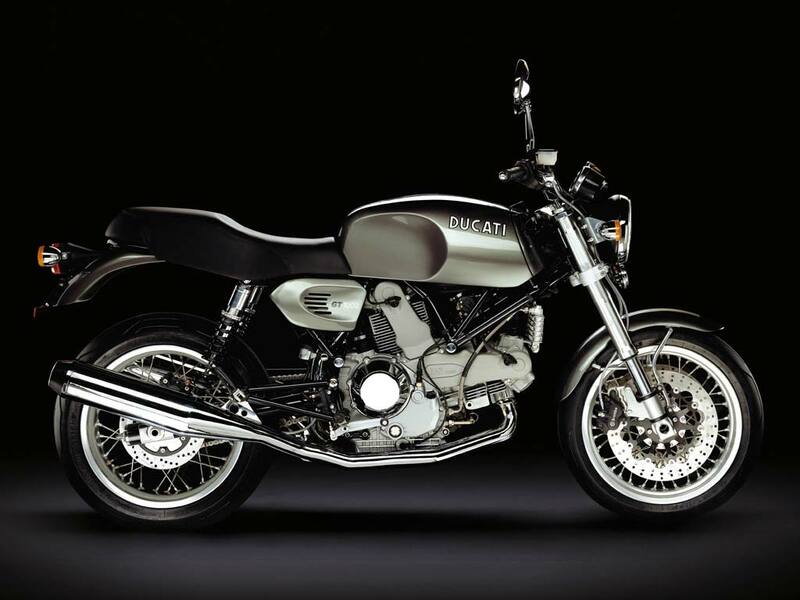 The philosophy that lies behind the new Ducati SportClassic family finds further emphasis in this new model, which completes the range and fully lives up to the expectations and promises made at the moment of its Tokyo Motorshow launch in October 2003. 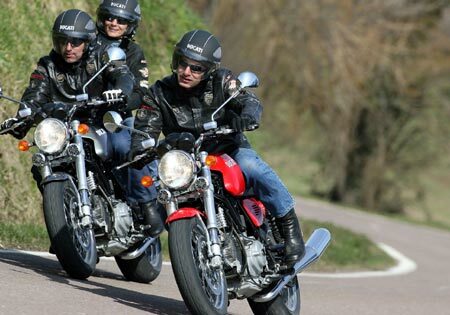 Although classically inspired, the GT is a modern Ducati motorcycle, so it must be powerful, handle confidently and be exciting to ride everyday. The shapes of the GT 1000 are modern interpretations of the classic lines of the original GT’s of the 70’s. The rather slim fuel tank features knee cut-outs on the sides and deep sculpting that allows a comfortable riding position. Full fender front is mounted with elegant aluminium tubing braces. The trim side covers remind us of the 70’s originals, and feature small venting holes for accent. Many of the details like the top crowns, fork caps and handlebar mounts are finished in polished aluminium, and are complimented with the chrome surfaces of the wheels, instrument trim, handlebars and horn covers. Finally, the classic look is completed with chrome full-length exhaust pipes and mufflers, one per side. The rider’s position on the GT 1000 is one of comfort and control. The chromed tubular steel handlebars enables an upright riding position to be maintained. A well-padded dual seat is sewn in a classic pattern and features ‘Ducati’ printed in white proudly on the back. Rider footpegs are placed conservatively forward allowing comfort and good ground clearance at the same time. The GT 1000 is a true two-seater, so the passenger’s footpegs are also sensibly placed for “all-day” comfort. The advanced Desmo 1000 Dual Spark engine powers the GT 1000. The torquey air-cooled L-Twin is the perfect match for the GT 1000’s comfort and performance attributes. Alloy cylinders, with their traditional cooling fins form the classic “L” configuration, reminding us of the original Taglioni design. Slim between the legs and exposed for all to see, the latest two valve Desmo system, fuel-injection, computer controlled engine management and Ducati Testastretta technology ensure that the 1000 DS engine is powerful, dependable and thrilling to ride. The new Ducati GT 1000 takes advantage of the signature Ducati ALS 450 steel tubular trellis frame, derived from the one fitted to the Paul Smart 1000 Limited Edition and the Sport 1000. Light, rigid and beautiful, it’s the perfect match to the GT 1000 and delivers precise and confident handling. The frame and swingarm are finished in gloss black paint. They are similar to the Sport 1000, except for the addition of mounting points for the twin shocks and the two side panels. The new GT 1000 has traditional chrome steel tubular handlebars, which use a classic bend and rise to produce a comfortable riding position that is ideal for every day and touring use. The GT 1000 model has the key chassis characteristics that are similar to the first two Ducati SportClassic models: although the GT 1000 has a slightly longer wheelbase of 1425 mm and trail of 103 mm, which is achieved by moving the fork legs forward by 25 mm with respect to the steering axis (front wheel offset) and setting fork rake at 24°. The GT 1000 uses a new welded steel tube swingarm, made from extruded, bent tubing with an outer diameter of 60 mm and wall thickness of 2 mm. It features two legs linked by an elliptical cross-member, thus ensuring a high level of rigidity, which has a positive effect on ride precision. The two swingarm legs are made from extruded, bent tubing, while the distinctive shape of the cross-member is created by pressing the circular steel tube. This new swingarm features the same simple, rational system used on the Paul Smart 1000 Limited Edition and the Sport 1000 for adjusting the drive chain tension. Although this system is reminiscent of systems used on bikes from the 1970s, a closer look shows that the swingarm, wheel hub and all the other components of the wheel set are much larger and robust than on motorcycles from that era to deliver modern sport bike performance, but with classic appeal. In the suspension department, the GT 1000, in line with the entire SportClassic family, mounts some of the highest quality componentry. Up front the bike is fitted with high performance 43 mm Marzocchi upside-down forks, derived from the Sport 1000. 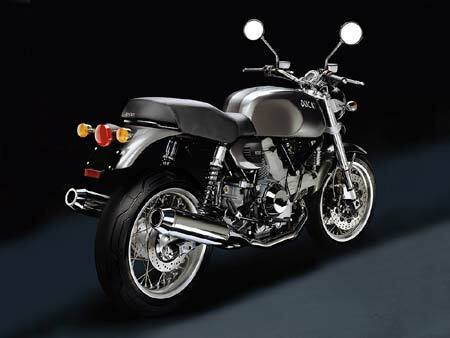 As the GT 1000 is a contemporary interpretation of the GT 750 of the 1970s, the rear suspension layout uses twin shocks, which are adjustable for spring pre-load. The two Sachs shocks also have a refined finish; the aluminium top collar, black springs and the bright zinc-coated shock body all recall the style of the past. Overall, the trellis frame and quality suspension combine making the GT 1000 a surprisingly competent sport bike, yet with great comfort and ergonomics for everyday two-up riding and weekend touring. Like the other SportClassics, the GT 1000 mounts classic wire-spoke wheels that enhance the ‘vintage’ style. The classic centre-spoke Excel 17″ wheels are formed in chromed steel and laced to silver painted aluminium alloy hubs. The wheels mount modern compound radial construction tube-type tires with tread designs derived from the classic sport bike patterns of the European sport tire manufacturers. The 36 chromed spokes are made of dehydrogenated steel and have a diameter of 4.4 mm. The impressive front brake system of the GT 1000 is derived from the first two SportClassic models, and consists of two Brembo floating callipers with 30 and 32 mm diameter pistons which are thermally insulated. The discs are semi-floating with a diameter of 320 mm and a thickness of 4 mm. The spoke wheels made it necessary to use this type of calliper, which is more compact on the side facing the wheel. The callipers on the GT 1000 are mounted on two hubs so that the pad on the opposite side of the pistons can be compressed against the disc. The rear brake system consists of a floating single piston Brembo 34 mm calliper with high friction sintered pads and a 245 mm disc. The decision to increase the size of the rear calliper over the other versions of the SportClassic family has been dictated by the GT 1000’s natural tendency for two-seater touring use. The GT 1000 sports a new stainless steel chromed exhaust system. The system features distinctive twin silencers positioned symmetrically on both sides of the bike. The lines and colours of the silencers take their styling cue from the exhausts used on GT bikes of the 70’s. A special feature of this system is the double-wall exhaust manifold. This is composed of two tubes, one inside the other, which creates a layer of air, thus providing lower temperatures of the outer tube. Thanks to this system, it is possible to ensure the lustre of the chrome finish, despite the considerably high temperatures of a modern-day exhaust system. The two manifolds, which are joined by a compensation tube on which the lambda probe is mounted, are connected to the two silencers, which are fixed to the foot-peg units by means of a black stainless steel support. The GT 1000 responsibly complies with EURO 3 anti-pollution standards by way of a lambda probe inside the compensation tube of the exhaust manifolds and two trivalent catalysers housed in the two silencers. Like the first two SportClassics, the GT 1000 also has a new layout for the electrical system, which helps to conceal the wiring while giving users easy access to all the main components of the system, which are located beneath the seat in a special storage compartment. A compact Magneti Marelli 5AM engine control unit manages the fuel injection and ignition of the GT’s 1000 DS engine. This contains the hybrid power circuits and a re-programmable Flash EPROM. An innovative feature is the use of a Stepper Motor for automatic control of idling speed, fitted on the throttle body, and of advanced PICO fuel injectors. Finally the multi-function display of the GT 1000 features a black faced analogue read-out speedometer and rev-counter. Software features of the GT 1000 include a trip-fuel function allowing remaining possible mileage to be checked whenever the fuel reserve light is on. The GT 1000, just like the two SportClassic models that came before it, introduces an array of features that profoundly reflect the style of the past, albeit in a modern way. The unmistakeable style of the GT 1000 is accentuated by the rounded lines of the fuel tank, the harmonious form of the side panels and the unique shape of the seat, which has been specifically designed for rider and passenger comfort, as well as the exclusive fully-chromed exhaust system and the gorgeous spoke wheels. Astride the bike you are immediately aware of the attention to detail: the shiny chromed fuel cap and the distinctive polished and anodised steering head that supports the chromed handlebars. The chromed rear-view mirrors are specially designed for this new SportClassic and their exceptional size ensures excellent rear visibility even with a passenger on board. Your gaze also falls upon the instrument panel with black faces and the entire display is further embellished by chromed trim rings and control buttons. The two special colours in the GT 1000 range, metallic dark grey and Ducati red, highlight the link between the past and the present of this historic model. The distinctive shape of the plush padded seat, highlighted with a stitched cover, helps to enhance the classic looks of the GT 1000, without neglecting rider and passenger comfort. The footpeg design compliments the GT 1000’s everyday use, and ensures a comfortable position both for the rider and the passenger in two-up riding. This attention to detail on the GT 1000 is also applied to components like the footpegs, where rider and passenger brackets, gear shifter and rear brake lever are fully integrated into one unit. The footpeg units are cast in aluminium alloy and painted black and are therefore perfectly integrated between the frame and the muffler support strut to which they are mounted. These fittings, specifically designed for the GT 1000’s everyday use, ensure a correct and comfortable position both for the rider and the passenger in two-up riding. The tail light unit, which is derived from the Paul Smart and the Sport 1000, has a characteristic rounded shape and a strong 1970’s styling. The chromed turn signals are integrated with the rear light/brake light and the whole unit is mounted on flexible supports. The battery housing and mounting is another element that links the GT 1000 with the two previous SportClassic models: the moulded plastic case, embossed with the traditional Ducati logo, pivots on two pins on the frame for easy battery removal. When choosing the power for the SportClassic family, the ideal choice was the muscular Desmodue 992cc air-cooled twin-cylinder Ducati 1000 Dual Spark engine, known and appreciated for its abundant torque and excellent reliability. The exuberance of this highly advanced power-unit perfectly underlines the true sporting character of the three SportClassic models. This Euro 3 compliant engine is the result of our most current engineering and easily meets the latest strict emission standards while producing excellent performance. Compact, powerful and acknowledged as the ultimate expression of the Ducati philosophy of air-cooled twin design, the 1000 Dual Spark Desmo – already used on the Monster, Multistrada and Super Sport families – represents the result of decades of experience and a whole series of innovations that extend from the combustion chambers to the crankshafts. The end result is a powerful engine that is particularly exuberant in the mid-range and generally acknowledged as the most advanced air-cooled L-twin ever designed. In addition to offering the significant advantages of an air-cooled power plant, the 1000 DS also draws inspiration from the advanced Testastretta racing engine, including the special casting techniques used to make the cylinder heads, the use of oil-pressurized plain bearings to support the camshafts and the angles and configuration of the valves. All this, plus the exclusive Dual Spark ignition, with its ‘double flame front’ offers more complete combustion, while simultaneously boosting mid-range power and reducing emission levels. In particular, on the GT 1000, the 1000 DS engine has been fitted with a wet clutch, which offers an excellent performance, reliability, noise reduction and lever effort. Finally the engine is embellished by injection-moulded timing belt covers in black plastic which have been specially designed for maximum mechanical and thermal resistance. All specifications are preliminary and subject to change.